The centre of excellence and metropolitan city of Lagos is one place virtually every Nigerian wishes to live in. But the cost of living – especially renting a home, can make you back off and decide to live elsewhere as they are doubled compared to other places in Nigeria. It’s no news that places on the Island like Ikoyi, Victoria Island and Lekki are the most sought after places in Lagos because they are fine, highly developed and hold some of the best hotels in Lagos. But then one must ‘cut a coat according to size’. So below I am going to be telling you some great but yet affordable places you can live in Lagos. Ikeja is the state capital of Lagos State. It is a well planned, clean and quiet residential and commercial town with shopping malls, pharmacies and government reservation areas. The Murtala Mohammed International Airport is located in Ikeja. It now boasts a shopping mall, Ikeja City Mall, which is the largest mall in the Mainland of Lagos State and also has a cinema. Yaba is a suburb located in Lagos Mainland LGA. There are many institutions of higher learning in the area like Queen's College, the Nigerian Institute of Medical Research, the Yaba College of Technology, Igbobi College, the University of Lagos, the Federal School Science and Technical College, and the Federal College of Education. Yaba has one of the busiest market sites in Lagos, known as Tejuosho Market, Nigeria, and also the technology hub of Nigeria. Surulere is a residential and commercial Local Government Area located on the mainland of Lagos. It is home to the Lagos National Stadium (capacity 60,000) built in 1972 for the All-Africa Games. One of the most popular places in Surulere is Ojuelegba. It is known for its crowded setting and regarded as one of the busiest places in Lagos. It connects the city's mainland with Lagos Island and Victoria Island. Ogba, about five kilometres west of Ikeja, is a densely populated area with a mix of housing for high and low income earners. Rents at the top end are lower than in Allen Avenue and Omole Estates. Ogba is located at the heart of Lagos metropolis and is therefore easily accessible by bus and taxi. Ogba has a popular Sunday market patronized by people from all over Lagos, an evening/night market and a handful of shopping malls. Small hotels, guest houses, eateries and drinking bars provide the only real relaxation in the area. Maryland is a residential and commercial area on the mainland of Lagos. It is located close to Ikeja and the Military Cantonment. 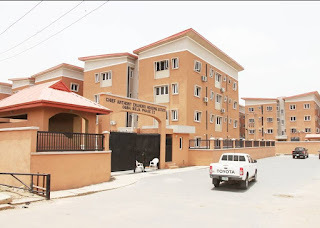 The area is quiet compared to other places in Lagos with several housing estates. The Maryland mall is opening soon. Apapa is a Local Government Area in Lagos, located to the west of Lagos Island. The region of Apapa lies near the mouth of Lagos lagoon, and contains ports and terminals for various commodities such as containers and bulk cargo, houses, offices and a small old disused railway station. It also houses some refineries like the Bua Group. It also has commercial offices of many shipping, clearing and transportation companies. Other notable buildings include the Folawiyo Towers. Apapa houses the headquarters of the Nigerian newspaper Thisday. Festac Town is a federal housing estate located along the Lagos-Badagry Expressway in Lagos State, Nigeria. Its name is derived from the acronym FESTAC, which stands for Second World African Festival of Arts and Culture that was held there in 1977. The Nigerian government invested substantial sums of money and resources into building Festac Town, which has state of the art electrical generators, police and fire stations, access to public transportation, supermarkets, banks, health centres, public restrooms, and postal services. Iyana Ipaja simply means the road that has branched off to Ipaja town in Yoruba language. The area now known as Iyana Ipaja was historically inhabited by the Mosakus, Alaagbas, Okis and the Alaguntans. Iyana Ipaja is in the Alimosho Local government of Lagos State. Other areas around Iyana Ipaja are Abule Egba, Akowonjo, Agege, Egbeda and Ikeja. Magodo is a place in Kosofe Local Government Area, Lagos. It lies toward the outskirts of Lagos in close proximity to Ikeja and Ojodu Berger. Magodo is basically a residential area that is known to be home to some affluent people of society. A great place to shop is the Ketu Market where all kinds of fresh foods and ingredients can be bought while the Ikeja City Mall located close to the area creates an avenue for people to catch some fun. The Writer, Akinsiku Hellen is a Tech-savvy and seasoned Communications Expert with extensive knowledge of media production (both traditional and online media), messaging, communications and dissemination techniques. With great flair for writing, her most powerful weapon is a pen because it allows her to express herself and draft her ideas. She has published over 350 articles on the web spanning across but not limited to various scopes like travel, food, health, business, fashion and relationships. You can visit her personal website at helenamag.com to see some articles she has published.